In AC electrical power systems, a synchroscope is a device that indicates the degree to which two systems (generators or power networks) are synchronized with each other. For two electrical systems to be considered synchronized, both systems must be operating at the same frequency, and the phase angle between the systems must be zero. Synchroscopes measure and display the frequency difference and phase angle between two power systems. Only when these two quantities are zero is it safe to connect the two systems together. Connecting two unsynchronized AC power systems together is likely to severely damage any equipment not protected by fuses or circuit breakers. This synchroscope was used to synchronize a factory's power plant with the utility's power grid. Since it is necessary to synchronize AC power systems before connecting them, synchroscopes are used in any power plant that connects to an outside power grid and also in isolated plants containing more than one generator, as each generator must be synchronized with the others before being connected to the plant bus. If line voltages are unequal when they are connected, a heavy current will flow as each line will attempt to equalize the other, causing damage in the process. When operators of an electric generator wish to connect it to the grid, they first start the generator spinning at a rate approximately equal to the line frequency of the grid with which they plan to connect. The voltage of the generator is then matched with the grid by adjusting the field/armature current. The synchroscope is connected to the power grid and to the generator being started. 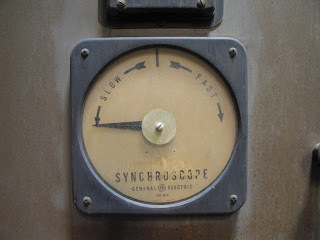 If the generator is turning at a lower frequency than the grid, the synchroscope needle rotates continually in the direction (usually counterclockwise) marked "slow" or "lag" on the dial to indicate that the generator is running slower than, or lagging behind, the grid. If the generator is running faster than the grid, the needle rotates continually in the opposite direction, marked "fast" or "lead". Next, the plant operator adjusts the speed of the generator until it is running at precisely the same speed (frequency) as the grid. As the frequency of the generator nears that of the grid, the synchroscope needle slows down and when the frequencies match, the needle stops rotating. At this point, there is one more task to perform before the generator can be connected to the grid. Although the generator and the grid are now operating at the same frequency, they are not necessarily at the same position in the rotational cycle as each other. If two electrical networks operating at two different phase angles were to be connected to each other, a fault similar to a short circuit would occur and most likely destroy the generator and damage the grid. If the needle reads "fast," then the plant's generator is slowed down by a very small amount and the needle turns counterclockwise (toward the zero mark). Alternatively, if the needle reads "slow," then the plant operator speeds the generator up slightly, and the needle turns clockwise. Slightly before the needle reaches the zero mark, the plant operator returns the generator to the grid frequency in order to stop the needle when it reaches the zero mark. When the needle is at zero and is not moving, the two systems are synchronized. Once the two systems are synchronized, they can be safely connected. Depending on the application and the circuit design, the breaker is closed when the synchroscope is pointing at approximately 5 minutes to noon, while traveling slowly in the fast direction, to allow the incoming generator to come onto the grid as a source. The purpose of this action is to prevent the possibility of the oncoming generator paralleling onto the grid as a load. This has the potential to cause the generator to operate as a motor which can cause damage to the generator and the prime mover. This page was last modified on 24 June 2011 at 23:56.